Magnitone London presents The Clean Sweep Skin Brush for Men, a powerful gadget that delivers a deep pore-cleansing action for clear, resilient, stronger skin. Engineered by men specifically for men, it works to effectively exfoliate the skin's surface – even under facial hair – to eliminate excess oil, dead skin cells, dirt and impurities, to get your skin in shape. The HydroPRO brush head works to lift stubble and detangle beards, helping to prevent ingrown hairs for a smoother shave. 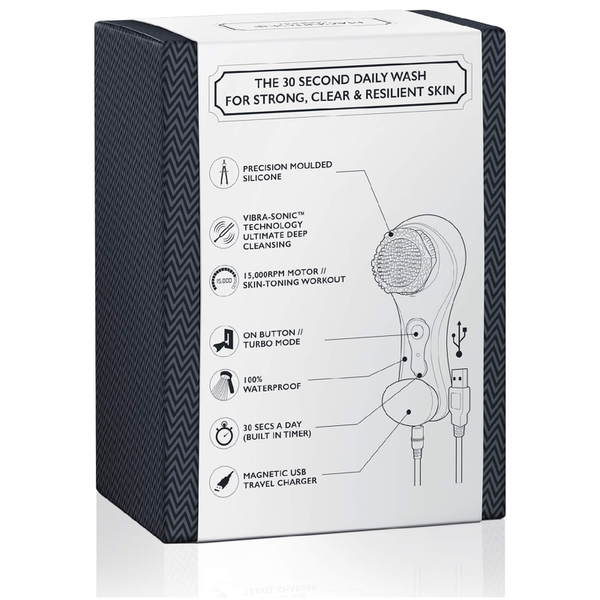 The innovative, double award-winning Vibra-Sonic™ Technology combines energising sonic oscillations and pulsed vibrations, to deep cleanse and boost micro-circulation for fresh, purified, conditioned skin. 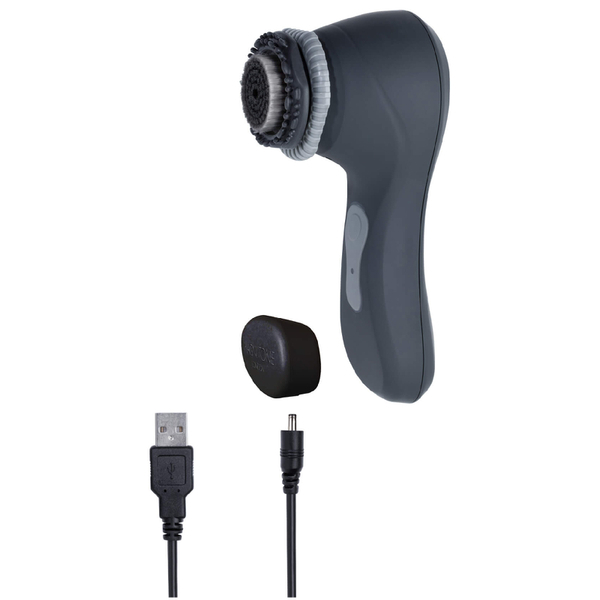 With a completely waterproof design, the brush features 2 speeds for a customised powerful skin workout in just 30 seconds a day. Why do you need The Clean Sweep? If you live in the city, invisible micro-pollutants get trapped in your pores, causing breakouts, dull and dry or irritated skin. The Clean Sweep is 5x more effective at washing your face than your hands, removing the daily grime you can’t see. Increasing blood flow to skin makes it healthier, stronger and more resilient, just like muscles after a workout. After 28 days of using The Clean Sweep, 100% of users felt they had better blood circulation*. * Home-use study, SGS Institut Fresenius GmbH 2013. Easy to use – one button wonder, 100% waterproof (use it in the shower), only takes 30 seconds. 1. Wet brush head and apply cleanser or shower gel directly to it. 2. Press the ON button. Press it again for TURBO. 3. In circulation motions, glide The Clean Sweep over your entire face (and beard). 4. When it turns off, you’re done. 5. Rinse face, shave or admire beard and go. I was bought this as a gift. I think it's really great. I don't have very good skin and I can already see a difference in the texture and appearance of it. It's also really good the heads are made to be used around stubble. I just keep mine in the shower so I don't forget to use it! Received this as a gift and don't' normally write reviews but this little brush is just amazing. The condition of my skin has never been better, black heads gone and ingrown hairs a thing of the past. Whatever they've packed into this brush it's amazingly smart and effective. Get one! This is an amazing product. I cleanse my face everyday even having my beard quite long. It is quick and effective. Absolutely recommended! I didnt expect this to be as great as it was, so was pleasantly surprised when after a few days I was already noticing my skin in better condition. Black heads around my nose were reduced and it felt like it was doing a great job of cleaning in and under my stubble. I like that it is waterproof so can use in the shower. Nice surprise to get a decent washbag inside as well. Overall pretty impressed. One of the best things I've gotten this year. After travelling, I've found it a struggle to get my skin back in order. It's just felt constantly clogged and nothing I have tried has cleansed it effectively. I couldn't wait to get my hands on this and had to pre-order it. I'd heard good things of Mangnitone so was excited when I heard they were bringing out a product specifically for men. From the first time I used it, my skin felt instantly smoother. I did notice a slight breakout after a couple of days, but this is a good sign because it's all the bad stuff coming out of your skin. 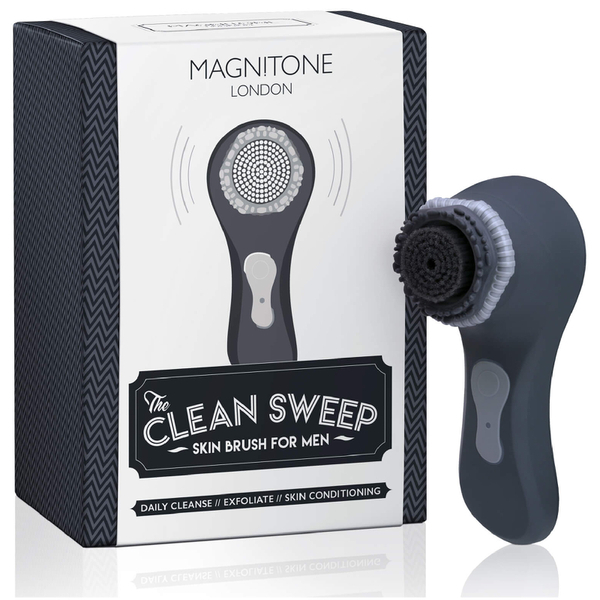 I've used the Magnitone Skin Brush for Men consistently now and I can honestly say it's one of the best things I've gotten this year.